Desarrollado desde 1952 como carro pesado con armamento más potente en comparación al T-43 (M103). Se impusieron restricciones al tamaño del vehículo, ya que el carro debía pasar por los estrechos túneles de los Alpes Berneses. Se consideraron varios diseños, pero se canceló el proyecto. No se fabricó ningún vehículo. 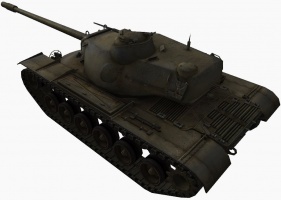 It replaced the T30 as the tier 10 heavy tank in patch 0.7.2. 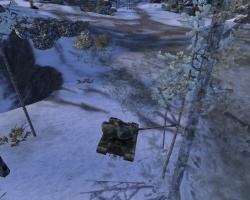 This tank has high penetration and relatively quick reload in exchange for a lower single-shot damage compared to many traditional heavy tanks. 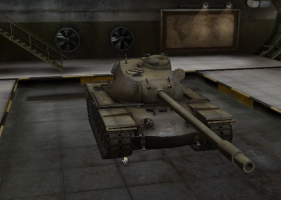 The T110E5 is a relatively quick heavy with good gun handling characteristics and has since patch 0.9.10 excellent armor values, allowing it to force other tanks to react its actions when driven well. 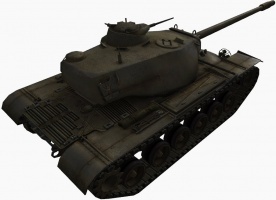 The T110 is something of a blend of heavy and medium characteristics, allowing it to fill almost any role on the field and perform well, but making it less specialized for specific roles compared to many other tier X tanks. The T110E5 retains the 'eggshell' style of front hull armor layout from the M103 and has greater protection in the areas of high thickness both in the hull and the turret. There is little increase in effective protection in the previously thin areas such as the lower plate however. 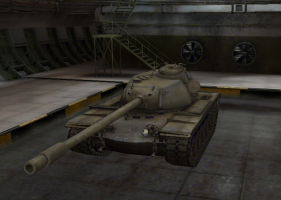 The T110E5 also has a prominent commander's cupola that invites shells from opposing players. However, such an obvious target can be a boon as much as a liability in the hands of a player familiar with baiting and misdirecting cupola shots by opponents; the cupola is more heavily armored than most US cupolas and can surprise many an opponent looking for a quick shot. Only very high penetrating shells (250+) will be able to go through the cupola since the armor buff of patch 0.9.10. 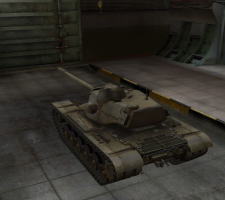 The T110E5 marks the end of its American heavy line. 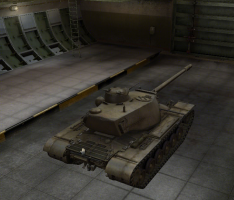 With reasonable protection at range, an excellent gun, makes the T110E5 possibly the most "versatile" tank in the game. 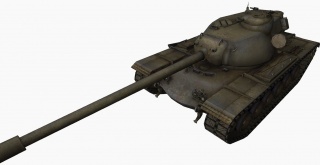 As is with its predecessor, the E5 is best used as a second line support tank as its weak spots become very easy to hit once up close, however it is more than capable of holding its ground in a brawl while in the hands of a skilled player that understands and utilizes angling and distraction techniques. 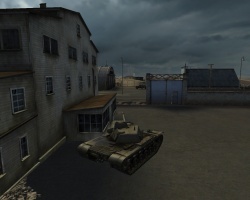 The original project of T110 was rejected by the military because of its excessive size (it wouldn't fit in the standard tunnel) and a poorly allocated commander tower, placed on the left. The company suggested another variant – the tower was placed at the center of the body, but, to solve the issue with fitting in the transmission, the driver-mechanic’s place was placed in the combat compartment. The latter was also ill received by the military and the driver’s was returned to the original place. When endorsing the project with the Detroit tank arsenal, the drive layout was decided to be remade into rear-wheeled. Now it was necessary to remove the commander tower altogether to keep the size in check. In addition, according to the order, instead of the AV-1790 engine, they had to use an air-cooled AOI-1490 with the power of 700 HP and the same XTG-500 transmission. The 120-mm T123E1 gun was placed on solid setting. Now there appeared problems with the power unit: it was out of reach. It was decided to make the engine “roll out” on the rails through a large manhole in the body’s rear. But a manhole like that drastically lowered the body’s rigidity. After all these troubles, Chrysler came up with the fourth variant of the tank. Now the AOI1490 engine and XTG-510 transmission were placed in the rear compartment of the tank, in a classic manner. The length of the body increased, but it would solve most of the problems with the power unit. The 120-mm gun was placed solidly in the mask, providing horizontal firing angles of 15 degrees to the sides and inclination angles of +20 degrees and -10 degrees. Constructing the cannon’s mask proved problematic. It has to be 230mm thick and weigh just under two tons. The body’s forehead sheet and the cabin defense was equal to a 127-mm sheet angled at 60 degrees. The support weapons included a 7,62mm machinegun, that was paired with the cannon and a 12,7-mm machinegun located in the commander tower. The telescopic sight T156 were used for shooting. M16A1 periscopic sight was used as a back-up. The tank commander was able to use the T53 “OPTAR” rangefinder, installed on the top of the cabin. “OPTAR” was an optical rangefinder, used to evaluate the range covered by light impulses. Needless to say that this device, preceding the laser technology, wasn't very effective and suffered from light dazzles. The T110E5 did not have an "eggshell" style frontal plate, it had a flat one (look at the mock up pictures above).